Is there an easy way to implement this? I would like to use external_id in my link, but I’m still not clear on how I would go about doing that. 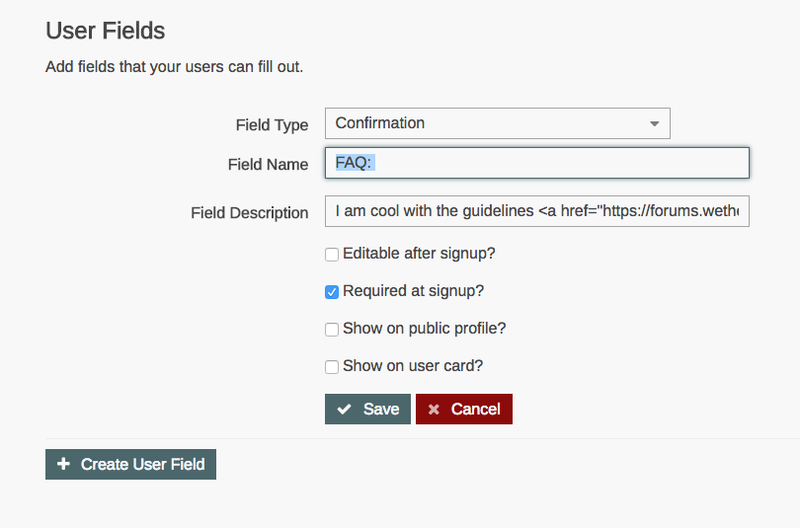 This needs to be done on SSO side, so you will need to look into how your SSO is set-up. I’m just using the WP Discourse plugin. When I visit the user profile as admin (/admin/users/2/[username]), I do see the External ID under the Single Sign On section at the bottom. Does that move me any further ahead in the process? Is it just a matter of properly modifying OP’s code? @Simon_Cossar, is there a good way to do this in the WP Discourse plugin? is there a good way to do this in the WP Discourse plugin? Yes, there is. What data do you want to add to the field? Just the External ID to a custom field. Aside from that, it would be cool if there was an easy way to do it for other fields as well. 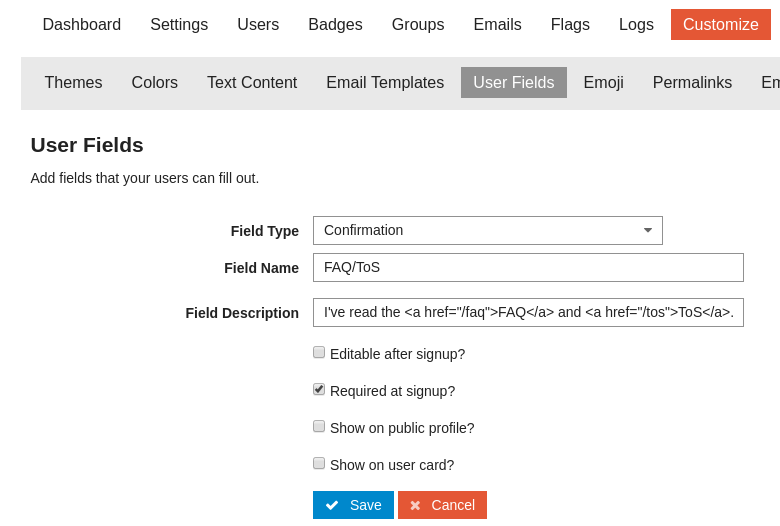 (ie location or any custom fields on the WP side). It’s not as easy as I thought. I might not be doing this correctly. The problem I’m having is that I can’t figure out how to access the value of that record on the front-end of Discourse. Thanks Simon! Yeah I just poked around as well and couldn’t find the field name anymore. How did you find it through the console? My solution seems wrong. I’ll look at this some more when I get a chance. I was having some trouble understanding why this works, but after looking through the code a bit more this seems to make sense as a way of setting custom fields through SSO. Unless there is a better way to do this, I’ll add it to the WP Discourse Plugin Tips and Tricks topic. This guide is now updated to deprecate api.container.lookupFactory in favor of api.modifyClass. I want to do something like this but then dont the users on your website now have 2 user profiles, one from discourse and one from your site? Same here, I want to link to the external profile from the users profile/card. I have the external_id synchronised during sso, so how to create that link or rather: how do I get the external_id available as a user field as described in the first post? For anyone who is not a coder wanting to link words in a customized user field to a webpage, here is how you do it. Awesome, thanks a lot. 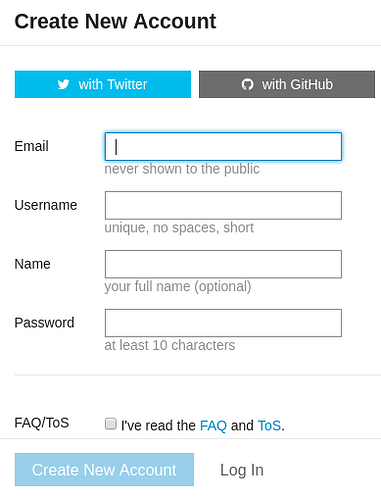 You can even shorten the ÙRL being a relative one if you just want to link to the FAQ or ToS on the same host. That makes the string shorter and more reliable if you ever change the VHost. If you prefer to open them in a new tab, add target="_blank" after the href. I've read the <a href="/faq">FAQ</a> and <a href="/tos">ToS</a>. Thanks, @dnsmichi. The shorter url and blank target edit worked like a charm. So instead of waiting for the external user ID become available I implemented as described in the first post. Replaced the constants with my data and created a rewrite from the Discourse user ID to my main sites user ID. It’s not working though. Only when I manually put the user id into the field of a profile it works. Wasn’t the point not to have the need to manually put the user ID into this field as per the inactive option “Editable after signup?” What am I missing? 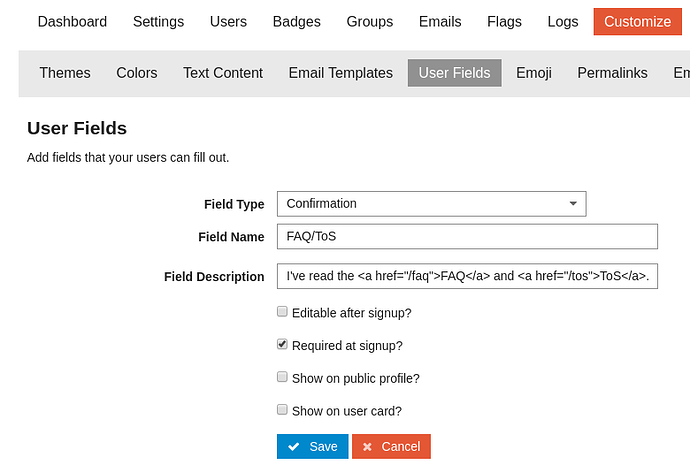 @techAPJ, I’m on Discourse 2.0.0b10, I’ve tried a bunch of modifications but can’t get the custom field to blend in correctly. With the default CSS it just shifts other custom fields. Any thoughts? Also, I usually have the “Website” custom field showing after the Farm/Company…" field, any way to do that? I feel like I’ve seen a discussion of this, but I can’t find it now. I’ve got a custom profile field that holds a user’s website implemented using this tutorial, but allowing for any external site to be entered, rather than just linking to Twitter or something. The problem I have is that about 80% of the users don’t bother to put “http(s)://” in front of the URL they enter. They (rightly) expect that “www.example.com” should just work. So how do I make it just work?